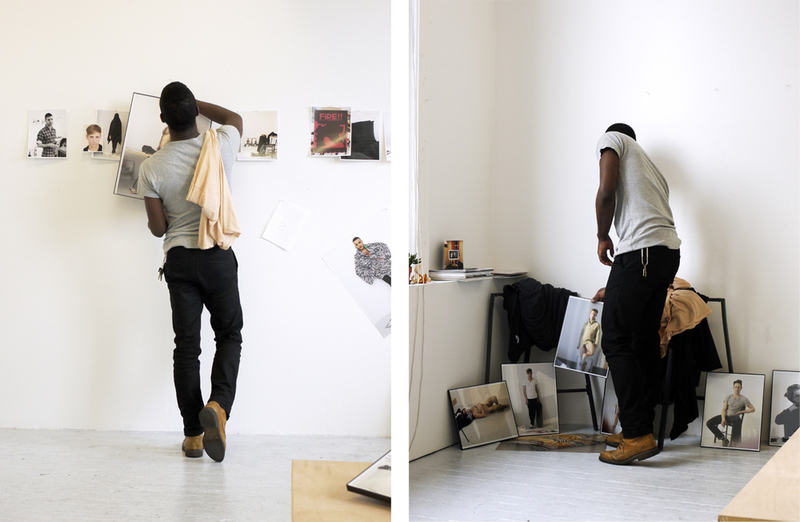 The body of material in Studio Work was developed during Paul Sepuya's 2011-2012 artist residency at the Studio Museum in Harlem. The project is both a volume of photographs—formal portraits, loose snapshots, still-lifes and details of the his studio space—and an ongoing and variable installation composed of those materials accumulated in the studio, tracing the artist’s occupation and photo-making from the beginning to the end of the residency. The work explores how the studio environment, as site of creation, editing, and accumulation, affects and frames portraiture and the performance of portraiture. A selection of these photographs are currently on display in Lightning Speed of the Present, a group show on view at 808 Gallery, Boston University, which includes Ben Barlow, Dineo Seshee Bopape, Georgina Lewis, Danica Phelps, Jacolby Slatterwhite, Sandrine Shaefer, Rachel Perry Welty, and August Ventimiglia. Paul Mpagi Sepuya (1982, San Bernardino, CA) lives and works in Brooklyn, New York. He studied photography and imaging at New York University’s Tisch School of the Arts. His work has been exhibited nationally and internationally in New York, Los Angeles, Basel, Sydney, Toronto, Paris, Berlin and Hamburg. His most recent artist publication, STUDIO WORK, was published in 2012 and the related body of work has been exhibited at The Studio Museum in Harlem, New York City, The Center for Photography at Woodstock, NY, Franklin Art Works, Minneapolis, and Artspeak, Vancouver, and will open this May at Platform Centre in Winnipeg. This Winter he will be artist-in-residence at the Hyde Park Arts Center in Chicago.